Montréal, May 8, 2017 - Yorbeau Resources Inc. (TSX: YRB.A) (the "Company" or "Yorbeau") is pleased to report on the exploration drilling done by an affiliate of Kinross Gold Corporation ("Kinross") on the Company's 100% owned Rouyn property ("Property") in Quebec, Canada. The Company signed a definitive agreement with Kinross in October 2016, whereby Kinross has the option to acquire a 100% interest in Yorbeau's Rouyn property ("Property") in Quebec, Canada. In order to earn the purchase option, Kinross must fund C$12 million dollars of exploration expenditures over a 4-year period, including a firm commitment to spend C$3 million in the first 18 months and no less than 12,500 meters of diamond drilling. As operator, Kinross has already completed a total of 16,048 metres of drilling in 23 holes. This drilling includes wedge-cuts and holes aborted due to excessive deviation. The meterage completed satisfies the minimum commitment of 12,500 metres specified in the agreement. Kinross reports that as of the end of March 2017 it has spent approximately C$1.9 million towards the C$3 million firm commitment. Note: uncut assay grades are reported and depth intervals are core length. The core lengths reported above are not true thickness. The horizontal widths range from 75 to 85% of the core lengths. The assays reported for the Lac Gamble zone include a wedge cut drilled in 2012 by Yorbeau and which was assayed in 2017 using the metallic screen fire assay method. 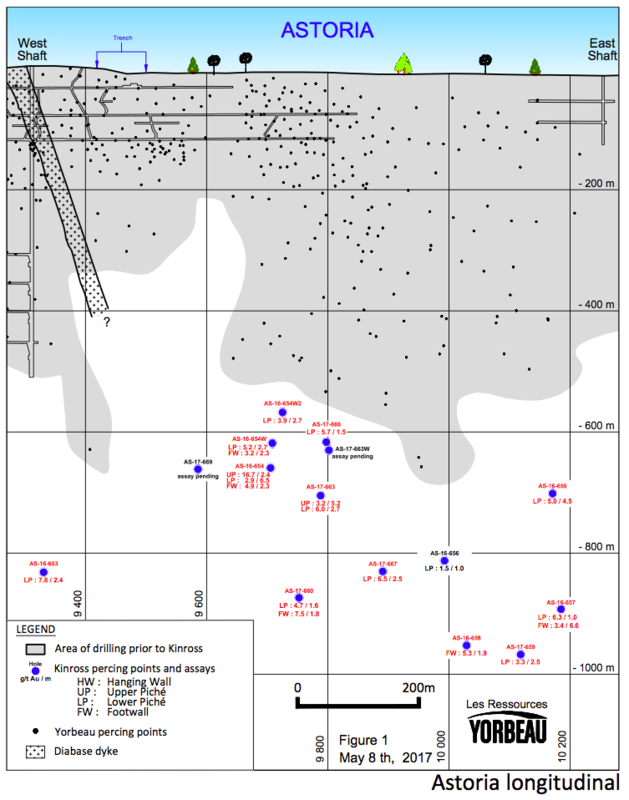 Drill hole locations are shown on the attached longitudinals (Figures 1 and 2). Two drill rigs have been operating since the beginning of the program but was reduced to one drill rig in early April due to wet spring conditions. 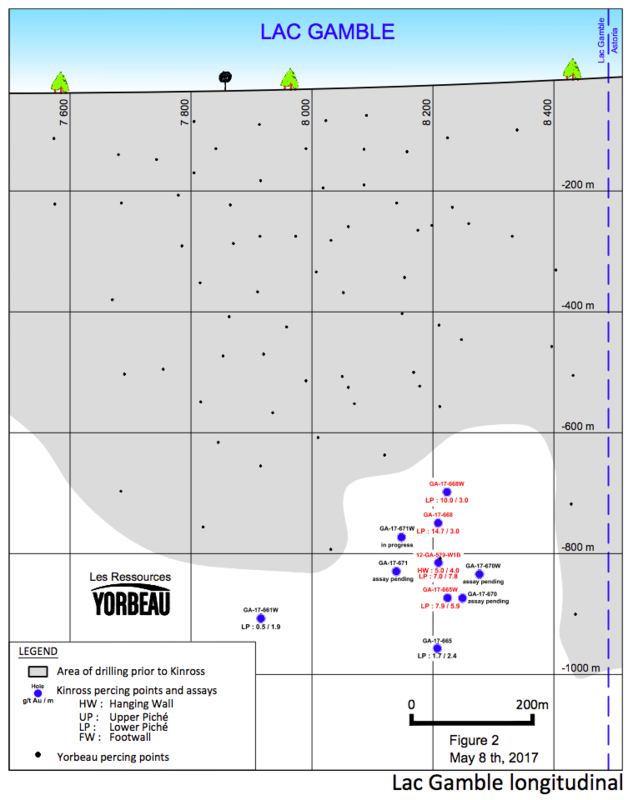 In addition to the mineralized intervals described in the above table, the longitudinals also show the recent holes with lower grades as well as the pierce points of holes previously drilled by Yorbeau. Significantly, the new drilling on Lac Gamble has outlined a high grade shoot with an apparent vertical continuity of over 200 m (Figure 2) and further drilling is in progress to test the strike length. Gérald Riverin, Company president commented: "We are very pleased with the work progress at the Rouyn property and with the exploration program established by Kinross in cooperation with the Yorbeau staff. The on-going program is generally confirming the extension of the mineralized systems at depth and we are looking forward for additional encouraging results at the Rouyn project". The design of the drilling program, Quality Assurance/Quality Control and interpretation of results is under the control of Kinross' and Yorbeau's geological staff, including qualified persons employing a strict QA/QC program consistent with NI 43-101 and industry best practices. Drill core is logged and split with half-core samples packaged and delivered to ALS Minerals laboratory in Val d'Or, Quebec. Thorough QA/QC protocols are followed on the project including insertion of duplicate, blank and standard samples in all drill holes. All samples are analyzed by Fire Assay with an Atomic Absorption (AA) finish using a 50 gram aliquot of pulverized material. Assays exceeding 3 g/t Au are re-assayed by Fire Assay with a Gravimetric Finish. Samples with visible gold are processed with a protocol involving fine grinding of the entire sample, followed by metallic screen analysis on one kilogram of pulverized material.